Fork Truck Brush Sweepers are ideal for interior and exterior commercial sweeping. Great for cleanup applications; docks, warehouses, and parking lots. Lightweight aluminum body with polypropylene bristles. Powder coat finish. Attach unit by sliding forks into pockets and securing with locking screws. Optional Magnets are a great asset to manufacturing and construction facilities. Enables the user to collect material in fewer passes. 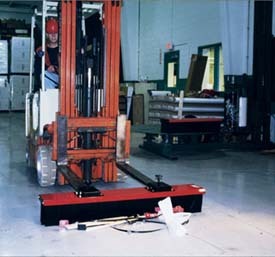 For best use, attach the magnet to the front of the existing broom and fasten to the forklift. Once in place, while traversing the desired area the magnet will detect metal items before they get caught in the bristles of the broom. Works with series VSWP and VPS. The optional Edge Markers work with the deluxe brush sweeper series VPS. The 36" high markers are a visible indicator of the edge of the room for safety precautions. The units height allows the user to be informed while still maintaining the proper drive position. Optional Dust Mop attaches to collect dust and fine particles on smooth floors. Works with series VSWP and VPS. Model PDF Overall Size (WxDxH) Fork Pocket (WxDxH) Sweeping Width Bristle Length Wt.